Figure 1. 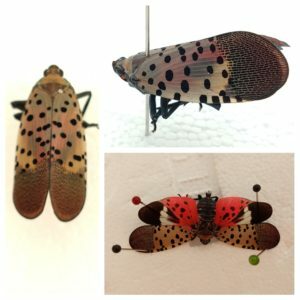 Spotted lanternfly adult from Hunterdon County farm. Photo – Karlton Neidigh & Atanas Atanassov. Brown Marmorated Stink Bug (BMSB): BMSB pressure as seen in pheromone traps has increased over the past week, but is still very spotty. The highest counts are in Hunterdon County with 1 farm having over 13 BMSB per trap. There is no trap or treatment threshold in peaches. Growers with positive counts should be on a BMSB protective schedule or using border sprays every 7 days. Growers are encouraged to use highly effective materials, and follow with Venom or Scorpion up to 3 days preharvest. San Jose Scale: Second generation scale crawlers appeared last week in southern counties. Crawler emergence will continue throughout August. In blocks where scale activity is observed on green fruit or at harvest should receive applications of either Esteem or Centaur either within the preharvest interval listed for the product, or in blocks that are harvested in early August, right after harvest. Belay and Actara also have good scale efficacy against crawlers. Refer to the product label for preharvest intervals and seasonal application limits. Brown Rot: Brown Rot pressure has increased after the past few weeks of wet weather. Nothing can be done other than to stay diligent with preharvest fungicide applications starting about 3 weeks prior to harvest. Some of the rot problems may be a result of environmental problems such as streaking and “cooked flesh” that resulted from the very hot and dry weather in June. Codling Moth (CM) and Oriental Fruit Moth (OFM): These two “worms” together can cause problems for apple growers late in the season. The timing for Oriental Fruit Moth in peaches is earlier than in apples. Any treatments applied for codling moth now, will also control oriental fruit moth. Codling Moth trap captures have increased on a number of farms. Trap counts range from 12-43 moths per trap in many North Jersey orchards. The treatment threshold is 5 moths per trap. As you can see from the trap count table, the averages in both North and South Jersey orchards is well above 5 moths per trap. In southern orchards, 3rd generation treatments are due now. If using Madex, then continue treatments every 5-6 days. Grape Berry Moth (GBM): Timing for the 4th generation will be due roughly around August 20-21in southern counties. Growers are advised to consider treatments only if pest pressure is high, especially around the edges of vineyards. GBM pressure along with various drosophila activity can combine to aggravate late season rot pressure. Grape Root Borer (GRB): So far in our counts this year in 8 vineyards, we have not found any with populations that are high enough to merit treatment. Most of the adult activity seen in the pheromone traps is from mostly wild sources. Putnam Scale: Second generation crawlers are active. Anybody who had any fruit infested with scale should treat those fields now. The keys to scale control are 1) High Volume sprays, 2) Timing, and 3) the correct material. Use plenty of spray volume for this spray. The two best choices for materials are Esteem and Diazinon. Diazinon can only be once post bloom, and it is still too early for the second generation Sharpnosed Leafhopper treatment. Therefore, if you plan to use Diazinon later for SNLH, then you have to use Esteem now. It’s the better material for this anyway. 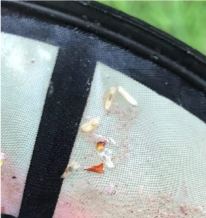 Spotted Wing Drosophila (SWD): Trap counts continue to increase. The highest counts this past week were 50 in Atlantic County and 68 in Burlington County. Treatments are over for most growers, but if you still have any Elliott still on the bushes, then treatments are still required. At the end of July we did get a positive fruit reading in a salt test. Spraying and picking had just stopped in this field. Sharpnosed Leafhopper (SNLH): Trap captures have increased, but this is still too early to define this as the second generation flight. Treatments are still Not suggested at this time.